Photo courtesy of Wild Horse Spirit, Ltd. 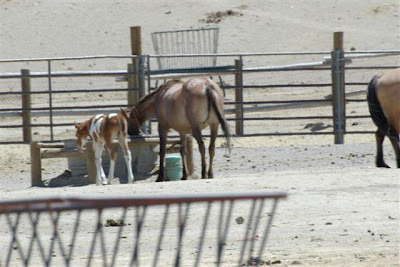 Despite the long list of undisputed and well-worn complaints regarding BLMs management of the Wild Horse and Burro Program, last week BLM scheduled the removal of a handful of wild burros at Owl Hole Springs with more round ups scheduled this week for a few isolated now “zeroed out” burros still clinging to their free-roaming lives within the Panamint, Slate and Centennial Herd Areas in California. 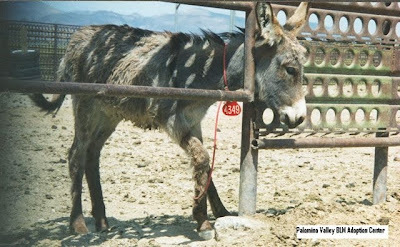 On August 19th, at the legally required public hearing held in Barstow, CA regarding BLMs plans to remove these burros, it was suggested the only hope they now had was through contacting California Senator Feinstein and urging her to intercede on the burros behalf. As a result, volunteer for California based Wild Burro Rescue Linda Lee has been in contact with Chris Carrillo of Senator Feinstein Los Angeles office this past month in efforts to urge Feinstein to finally take action. 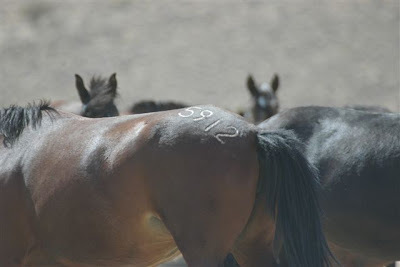 According to Ms. Lee, “As the author of the California Desert Protection Act, Senator Feinstein stated in her 2005 letter to then DOI Secretary Gale Norton that she strongly believed wild burros were a part of the heritage of the Mojave Desert - having been present in this area since CA's Gold Rush. Senator Feinstein went on to say that she opposed any efforts to remove these wild burros from their legal Herd Areas and that she wanted to be immediately informed of any removal plans". In response, I submitted the following letter to Senator Feinstein’s office today urging her immediate intercession in this matter. In order to help raise public awareness of the critical conditions facing California’s now forgotten wild burro herds, I am reprinting it here. 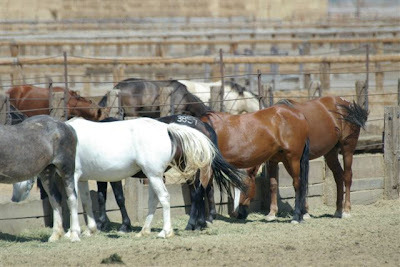 There is also contact information for Senator Feinstein and Senator Boxer listed at the bottom of this post if you would like to add your own voice to the growing demand for our representatives to begin stepping up to the plate by honoring both law and intent of the Wild Free-Roaming Horse and Burro Act before it's too late! 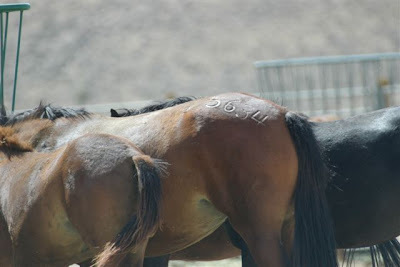 As a life long resident of both California and Nevada who has watched our wild burro herds disappear, I am writing today to implore you to begin honoring promises made to the American people given through the Wild Free-Roaming Horse and Burro Act - as well as the promise given by yourself four long years ago - regarding your support for protecting and preserving California’s historic wild burros herds. Wild burros were once considered an icon of the American West with California taking the lead by declaring them “California’s Mascot”, as it was once home to the largest wild burro population in the country. Even prior to the passage of the 1971 Act, California had initiated state protections for wild burros through California Fish & Game Code 4600, which still stands today. At the time of passage of the California Desert Conservation Area Plan (1980), the Bureau of Land Management (BLM) acknowledged there were 19 recognized Herd Management Areas that could be managed for wild burros within “the natural thriving ecological balance” and 14 were officially designated for that purpose within the Conservation Area alone. The combined BLM approved “appropriate management levels” totaled 2,747 wild burros with their available habitat totaling approximately 3,500,00 million acres. Today, this same area has less than 300,000 acres of habitat remaining and only 229 or less wild burros are now considered “appropriate” – a 90% reduction in both habitat and populations - despite their supposed federal and state protected status. Throughout the entire state of California, there are now only 3 remaining wild burro herds, none of which are being managed for genetically viable populations. 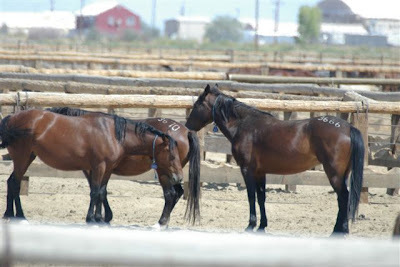 The entire combined “allowed” population issued by BLM for all wild burros in the State of California is merely 345 animals (this number accounts for the fact that BLM is currently padding California’s AML by adding populations into their “allowed” numbers that no longer exist due to removals) with over three million acres of habitat now completely eliminated, or seventy-five percent of their former ranges now gone. And the round ups continue…. On this clear and present course for “managed extinction”, how much lower do wild burro populations and their home ranges have to be gutted before someone begins to honor both law and the promises made to the American people to insure their protection and preservation? Right now, the BLM is planning on conducting removals yet again to sweep tiny handfuls of isolated burro herds from lands once dedicated for the purpose of including them within the natural system of public lands. 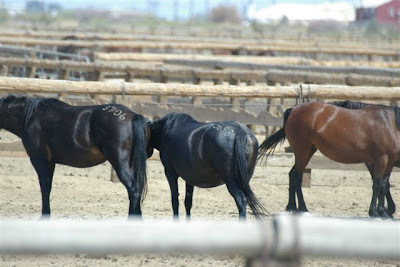 Yet, as can be seen from California’s abysmal statistics, no amount of public involvement has been successful in halting the BLM and various agencies in their conspiracies and achievement of decimating the largest wild burro population in the nation – these precious heritage herds now lost to us forever. 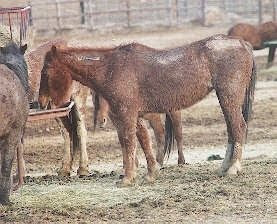 And so, with the public having no reasonable recourse left, as all our pleas for either justice or mercy continue to fall on deaf ears, I turn to you in desperate hopes that you will honor your former commitment and keep your word to protect and preserve California’s remaining burros by acting as true representative of both people and law. PLEASE PICK UP THE PHONE NOW AND CALL BLM TO DEMAND AN IMMEDIATE HALT ON ANY FURTHER ROUND UPS OF CALIFORNIA’S WILD BURROS! It is their last hope and chance. 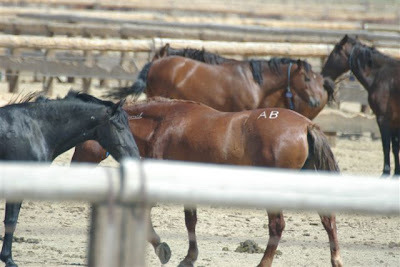 The BLM National WH&B Advisory Board has been set for Monday, September 28, 2009 in Arlington, Virginia. Public comments will be accepted until September 23, 2009. Click Here to learn more. Watch current National Wild Horse & Burro Advisory Board members use their positions to misrepresent facts in order to promote their own special interests. See “Doctor” Boyd Spratling, currently BLM’s chosen representative for Veterinary Medicine, describe “some” livestock grazing in wild horse territory (Dr. Spratling is also the ex-President of Nevada’s Cattleman’s Association) and Representative for Wildlife, Larry Johnson, (ex-President of Nevada Bighorn Unlimited and still serving on the Board of Directors for NBU), "spin the numbers" (where did he get this information from?) 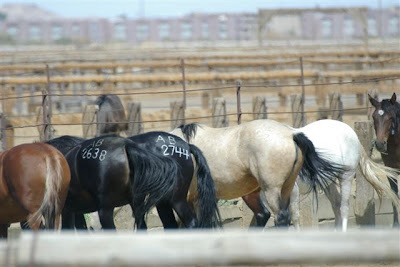 as well as promoting alternatives to dispose of “excess” animals, such as their unlimited sale – all while he professes his great and undying life-long love of wild horses. 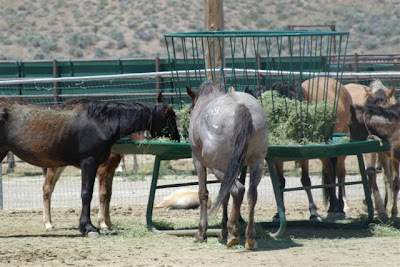 Click Here to access archived shows and then select Wednesday, August 26, 2009 to watch these Wild Horse and Burro “Advisors” in action! BLM announces the removal of wild burros from multiple sites within Southern California. No current documents, NEPA analysis or Decision Record authorizing these removals has yet been found but a BLM response is still pending. Click Here to learn more. BLM has signed the Final Decision to remove approximately 650 wild horses from these HMAs. The public has until September 19, 2009 to submit an appeal of BLMs proposal to the Interior Board of Land of Appeals (Please consider ignoring BLMs posted date of September 24, 2009 as IBLA is very strict on the 30 day time limit for appeal submission and it is highly probably that they will throw out a “late appeal” for this reason. There is no public recourse if BLM lies about the submission date). Click Here to learn more. 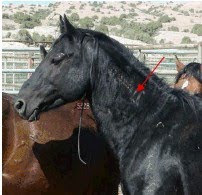 Remove approximately 440 wild horses in October 2009 with 22-42 wild horses allowed to remain. Public comments accepted through Friday, September 18, 2009. Click Here to learn more. 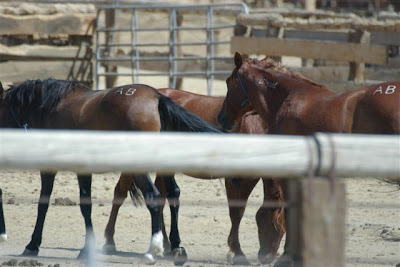 Approximately 700 wild horses are being planned for removals. Public comments will be accepted through October 1, 2009. Click Here to learn more. 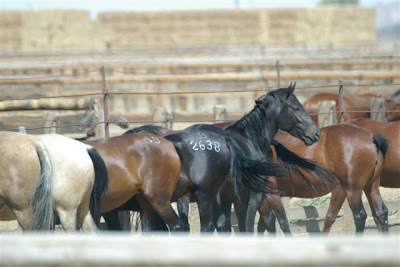 Approximately 206 wild horses will be removed between October 6th thru October 13th. The Decision Record has already been signed so the only available option left for public involvement is to appeal the decision. However, while there is a brief notice describing the round up, there are no posted documents such as an EA, Decision Record or instructions on how to appeal currently available online. Click Here to learn more. 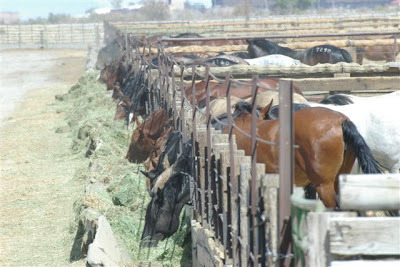 Authorizes current removals of approximately 320 wild horses. Also authorizes future removals, administering fertility control and gelding stallions “as needed” during the life of the plan. On a bright note, BLM has rescinded their original decision issued on August 19, 2009, which granted them a 10-year “contract” to do whatever they needed to do without further public notice or involvement. While BLMs revised “Dear Reader Letter” states that the NEW EA is provided via an online link, turns out the link is broken. Big surprise, heh? Since the Decision Record has been signed, the public’s only option is to appeal the decision, despite no public access to the “revised” long-term plan or instructions on how to appeal BLMs decision if we found something in the new management plan we wanted to appeal. Appeals will be accepted until October 2, 2009. Click Here to watch Oregon’s BLM block public access, public involvement and the promised “change” of government transparency (NOT!) 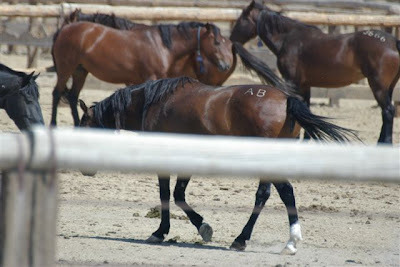 as they have authorized “something” regarding the Beaty Butte wild horses, but only they know what it actually is. If anyone wants to take a good, hard look at BLM round ups, obstructionism and how BLM isn’t even interested in listening to Congressional Representative Grijalva’s demands for accountability (much less the general public), check out The Cloud Foundations website, which now includes a new blog to inform the public of the harsh realities facing us regarding the continued unchecked "management" of our fast disappearing wild horse and burro herds and their home ranges. TCF is also calling for continued public pressure to have BLM return now removed Pryor Mountain wild horses back to their lawful range. Click Here to learn more. 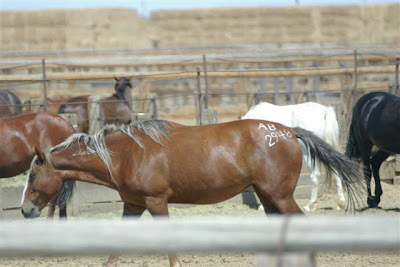 To view Congressional Representative Grijalva's ignored letter demanding BLM stop the round up of the Pryor Mountain wild horses as well as issuing a "cease and desist" for all future round ups across the West until BLM finally coughs up some sincere answers, Click Here.